IPWL have developed an integrated arc welding data logger and monitoring system for their Firefly orbital welding machine. The system offers users a built-in solution â€“ a seamless integration with minimal start up times and no external cabling. Mounted to the front of the Firefly digital control box, the eight inch touch-screen unit will monitor variables such as arc voltage, arc current, wire feed speed, travel speed, arc time and traverse speed. Data is captured digitally, direct from the weld power source. The video footage shows the unit being used on a site in Belgium. The purpose of the unit is to aid the decision making process by providing users with information about the actual weld. Real-time weld monitoring â€“ the unit measures the defined variables (e.g. voltage, wire speed) to enable a comparison of those variables to upper and lower limits within the weld procedure, then communicates the results of this comparison. Weld data acquisition â€“ the unit measures, displays and stores the defined variables to evaluate specific arc characteristics. Production data â€“ the unit provides various layers of productivity related information. The value of the unit comes when the output is compared to the pre-set tolerances for the work-piece. 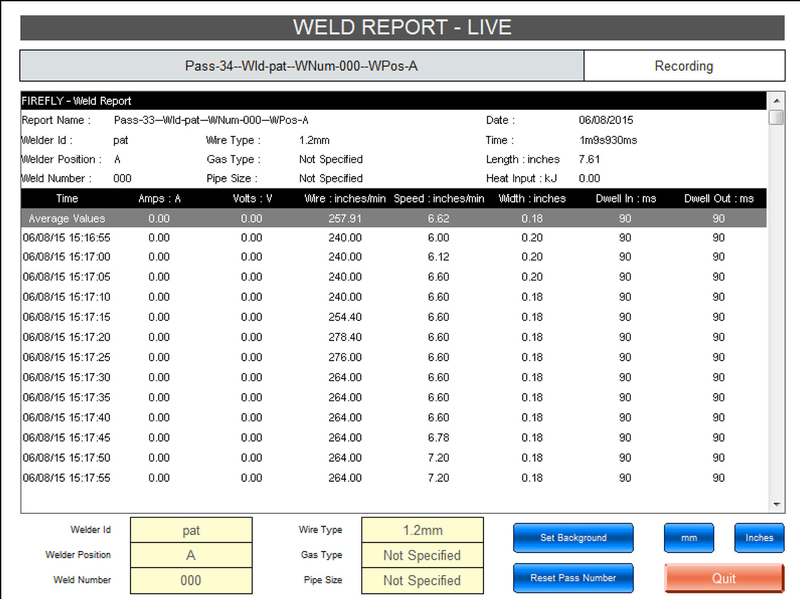 Armed with real time information, the user can quickly identify potential process variances and take the appropriate remedial action to ensure the weld procedure is followed. The unit is already fully integrated; there is no setting up time. The operator enters basic data about the weld â€“ for example, user ID, weld number, welder position â€“ itâ€™s then ready to go. Just press â€˜arc-onâ€™ and the unit starts to record the weld data. A typical display screen is shown in Figure 3. 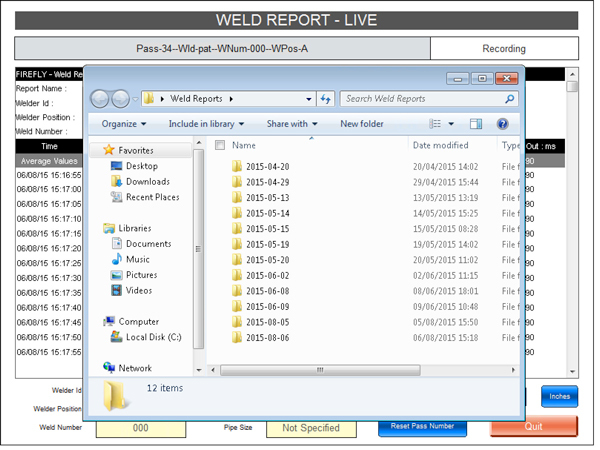 Weld records are a significant part of the huge amount of documentation required to achieve weld validation. The unit will allow the actual data to be exported directly to a computer for compilation of weld records for the job â€“ there is no need to re-enter data manually from reams of printed material. If printed documentation is required for QA purposes, data can be printed from an automatically generated PDF report. A sample PDF report is shown in Figure 4. Figure 4. 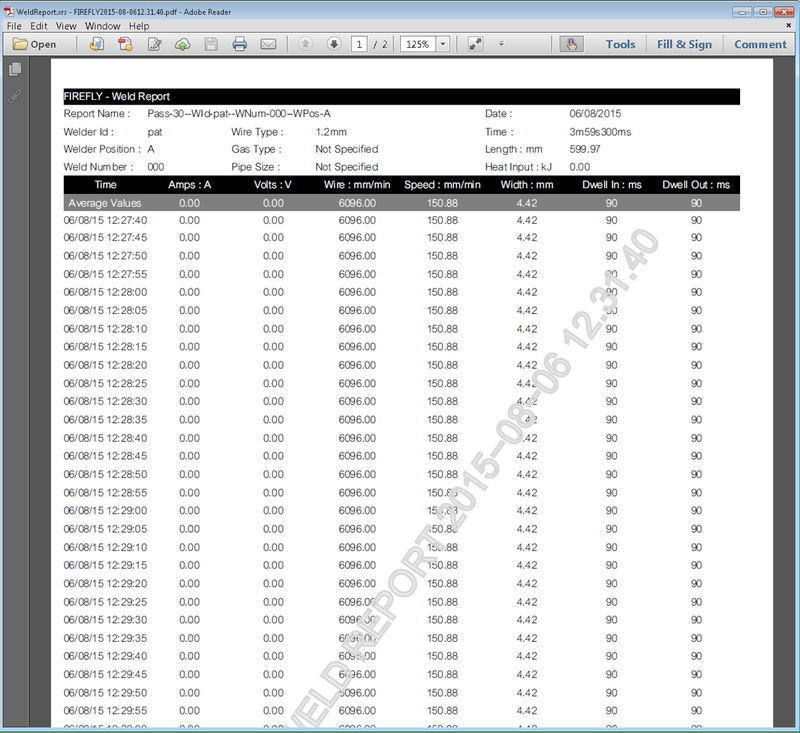 Sample PDF report. Data can be stored on a computer for easy access, as shown in Figure 5. Figure 5. Storing the data. As well as PDF format, data can be stored in CSV file format. This enables import into, for example, an external QA database. 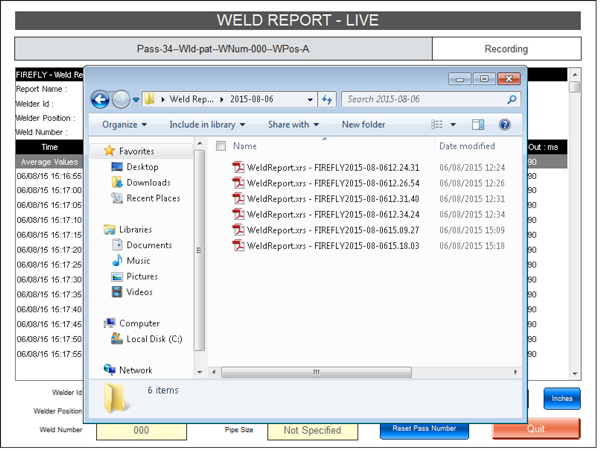 Such a database could facilitate the ability to locate a particular weld record by using search terms such as operator, weld date or Firefly ID. As the users monitoring needs evolve, the unitâ€™s more advanced capabilities can be brought in to play.